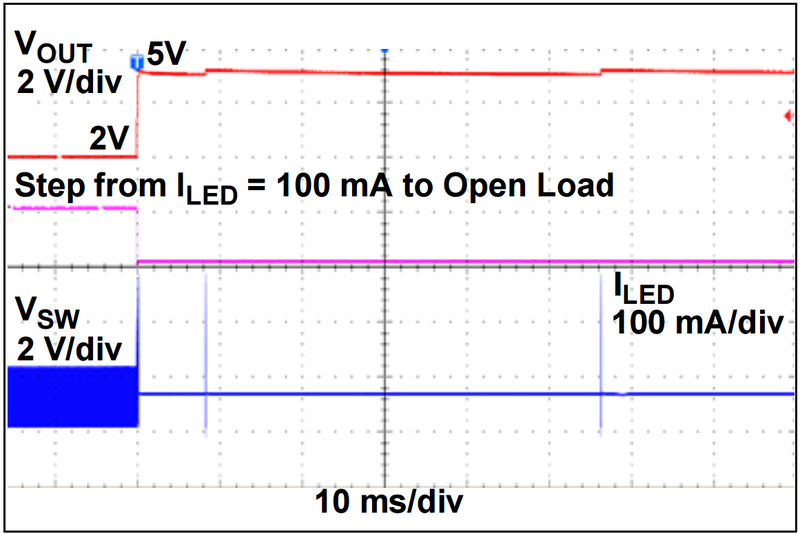 This chapter presents an introduction to Microchip’s Peak Current Mode Step-Up (Boost) Converters for driving LEDs in lighting applications. The goal of these case studies is to understand the impact of the input voltage, load current, and passive components to the quality and stability of the output current. Chapter 1 of this workbook, Getting Started with MPLAB® Mindi™ Analog Simulator. Review the MCP1643, MCP1662, and MCP1664 Datasheets. The MCP1643 regulates current by sensing the voltage across a shunt resistor in series with the LEDs. The EN pin can be used for LED dimming by driving it with a variable duty cycle PWM signal, as seen in the figure below on the left. 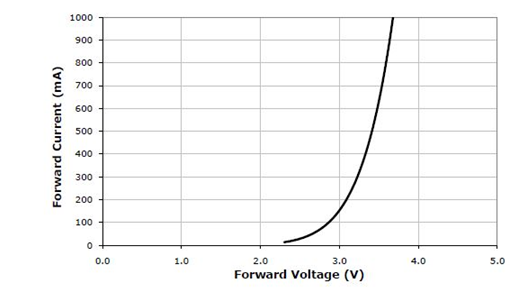 By varying the duty cycle, the average LED current changes proportionally, as shown in the figure below on the right. Open the 'Synchronous boost example, Generic LED dimming' application schematic from Power Management > Switching Regulators > MCP1643. Edit the source driving the EN pin to match the figure to the right. Change the LED current by modifying RLOAD1 to be 0.12/200 m, which is the 0.12 V internal reference divided by the desired 200 mA LED current. Run a transient analysis with a stop time of 3 ms and use the cursors to measure key parameters. 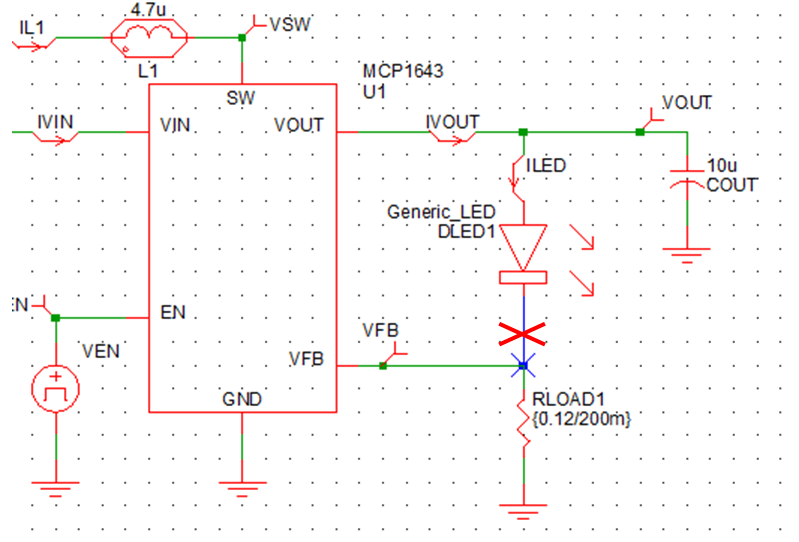 From the Measure > Mean/cycle menu, determine the mean LED current. 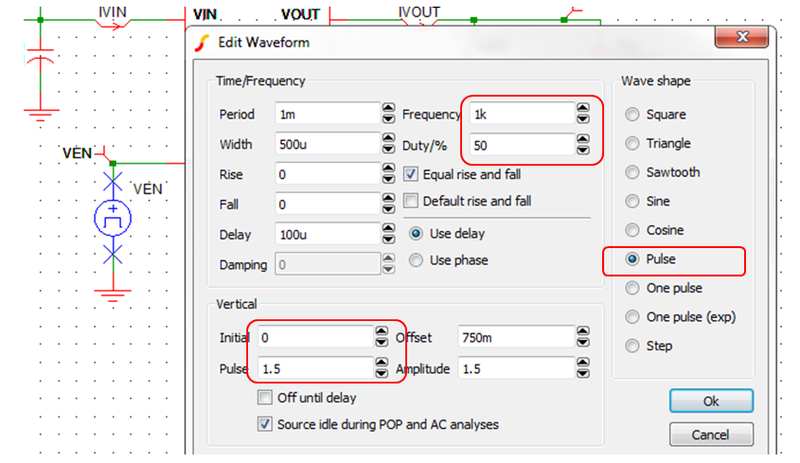 Repeat this simulation with different VEN source parameters, such as duty cycle and frequency, and find the value of the mean/cycle ILED output current. 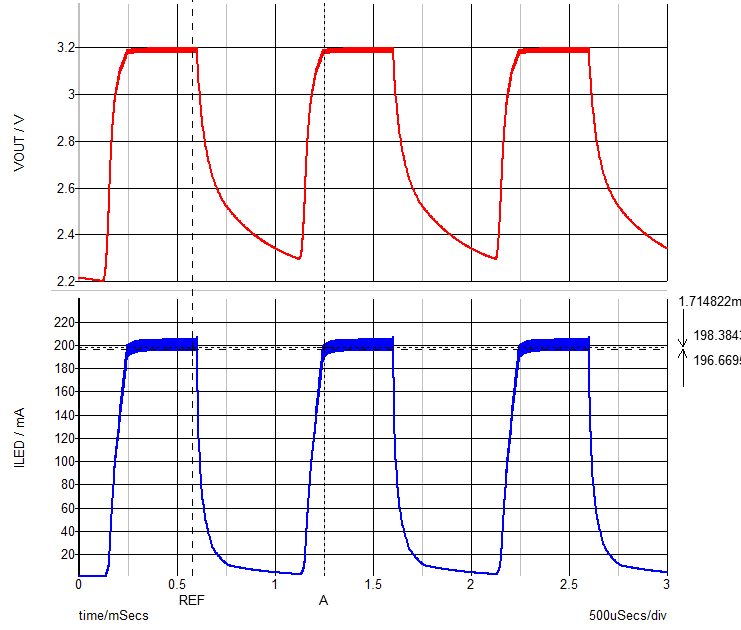 Adjust the value of RSET and rerun the simulations to observe the LED current. The goal of this section is to understand how Output Overvoltage Protection works with the MCP1643. Overvoltage protection is designed to save the MCP1643 if the output voltage exceeds 5.0 V. If the load is disconnected (an LED fails), the output voltage increases rapidly, because this topology is regulating the current, which is 0. The protection circuit trips, stops the switching, and periodically monitors the output to verify that the fault is still present. Open the 'Synchronous boost example, startup' application schematic from Power Management > Switching Regulators > MCP1643. Remove the wire between the Cathode of DLED1 and RLOAD. Choose the transient analysis with a stop time of 20 ms and run it. Using cursors, measure VOUT and identify where the limitation occurs. Notice the waveform shape corresponding to the periodic restart attempts. The goal of this section is to improve your ability to include LEDs in simulations. A real LED is a two-pin nonlinear semiconductor device, as seen in the figure to the right. Each LED has slightly different characteristics, which makes modeling the nonlinearity challenging. The MPLAB Mindi Analog Simulator LED model utilizes a PWL block, which can be customized based either upon the LED’s datasheet or parameters obtained by characterizing the device. The nonlinear curve is approximated by linear segments that are defined by a table of vertices. The model accuracy can, therefore, be controlled by the number of segments. The LED model included in the MCP1643 example schematics can be easily placed into other device’s schematics as long as the LED model block in the same folder is copied as well. 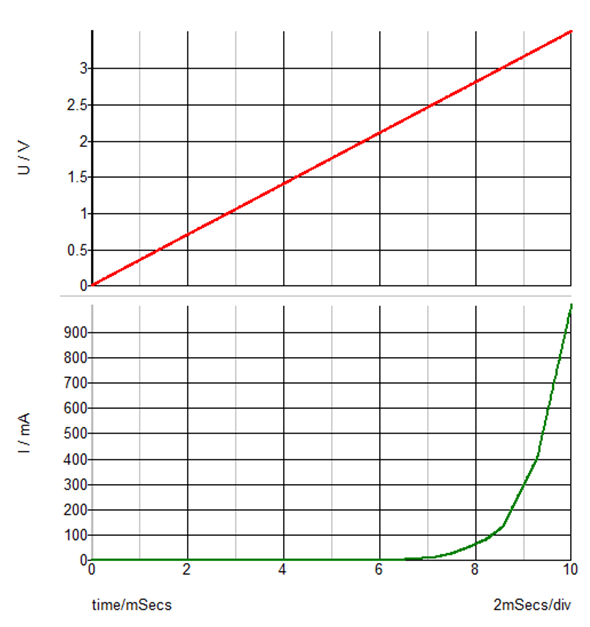 What you need for customizing the LED model is the I/V graph from its data sheet as shown in the example below. This is for an XLAMP7090XRE LED type. Open the 'Synchronous boost example, steady state' application schematic from Power Management > Switching Regulators > MCP1643. 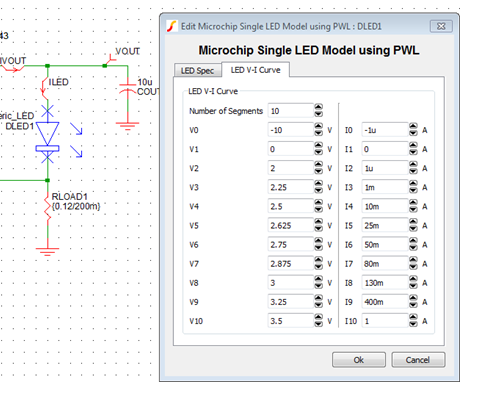 Edit the LED parameters and click on the 'LED V-I Curve' tab to bring up the window below. As mentioned above, the accuracy of the model depends on how many segments the I/V curve is made of. The default value is 10 segments. The first point is the reverse current, the second one is the zero point for both voltage and current, and then the actual forward drop / direct current data begins. The resulted graph looks quite similar to the one in the datasheet, where the input values were taken from. Now the LED Model is ready to be placed in the real schematic.